I’ve been eagerly awaiting this post all week, and now it’s here! I absolutely love to see the stylish outfits fashion bloggers come up with for my “Fashion meets Interior Design” series. Today our blogger comes from Ireland and she has put together a seriously chic outfit for us based on this moody interior design. When bright shades are paired with dark, moody colors a truly unique look is created, which fashion blogger Niamh McKeever explores today. My name is Niamh McKeever (pronounced “Eve” with an “N” for all you non-Irish) and I’m the Dublin-based blogger behind the blog Your Lawless. I’ve had the pleasure of living in New York on and off for the past two years working as a film production assistant and costume design assistant. I love life on the go and this year I will be moving to Mexico to Costume Design a play, which I am extremely excited about. I started Lawless back in February 2015 to create a site that was passionate about fashion and shopping for chic ladies like myself. The name Lawless is actually my mums maiden name, who has always had a love for fashion. I also have a love and appreciate for fashion, but I don’t follow trends or have a style rule book. I simply like what I like and wear what I want, and so “Lawless” seemed to be the perfect name for my blog. 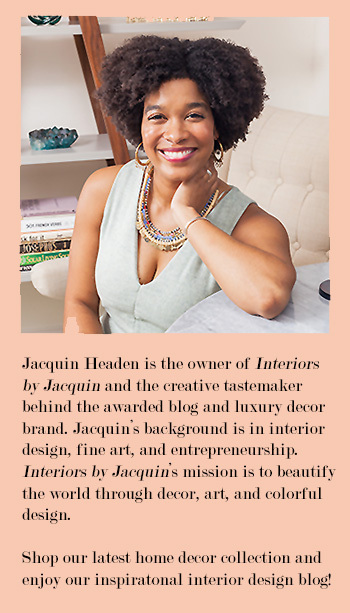 I was instantly intrigued by the interior design inspiration Jacquin sent me. The contrast of color and pattern made this design a must for me. 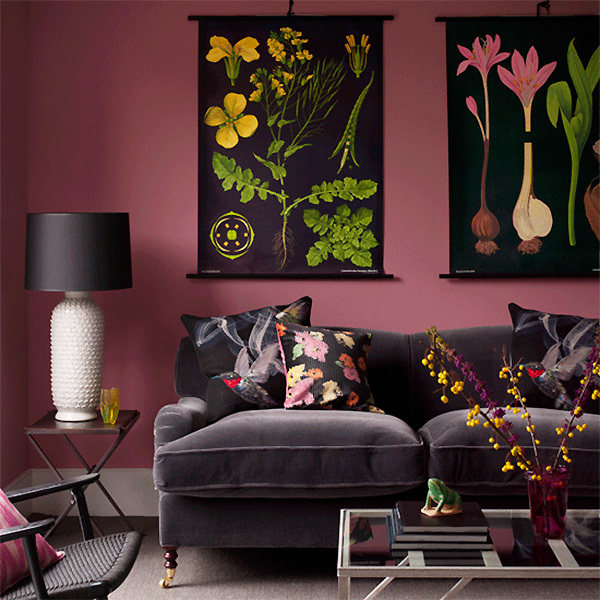 I was immediately drawn to the multi-colored floral pattern combined with the contrast of dark colors. I decided to go for a beautiful floral skirt I bought at Alice and Oliva. This skirt was the perfect match for the interior design inspiration because to my delight, the pattern on the skirt is quite similar to the design photo. For my top, I’m wearing a beautiful bodysuit from Missguided. Missguided is an online store that is very popular in the UK and Ireland and is one of my favorite shops. (It’s available in the U.S. too!) Among other stylish gear, Missguided has a large selection of bodysuits whether you are look for long sleeve, short sleeve, plunging neck line, or a turtle neck, they have a bodysuit available in every color. It’s addictive. When styling an outfit with a strong lavish pattern or bold embellishments, you have to be very careful not to overdo it. Black is usually, if not always, a good color to mix and match. However, if you are going to wear a strong pattern don’t be afraid to experiment with it. One of my favorite looks from this summer was a Dolce and Gabbana combo of floral print and check. Own what you wear and don’t be afraid to be unique. Fashion is fun, so have fun with it! You can find my turtleneck bodysuit from Missguided here. Also remember to check out their other bodysuit designs while you’re on the website. A bodysuit can be a great wardrobe staple! As for my Alice and Olivia skirt, it is now sold out, but take a look at these fab Alice & Olivia skirts here, here, and here. Stop by Niamh’s fashion blog Lawless for your dose of style inspiration and fashion tips. 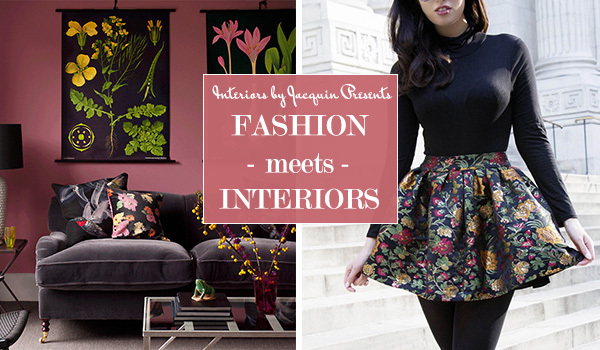 If you’re craving more of my “Fashion meets Interior Design” series click here to see the other stylish outfits created for this truly unique series, only found here on Interiors by Jacquin blog. Thanks for reading!